SenseAir, a world-leading manufacturer of infrared carbon dioxide sensors and controllers, has designed a new CO2 sensor, the eSENSE U, for exclusive sale at alpscontrols.com. The eSENSE U measures and controls indoor air quality to ensure occupant comfort. It features multiple outputs (0-5V, 0-10V or 4-20mA), the ability to turn off automatic self-calibration logic with a simple jumper selection, and it's available with or without an LCD for the same low price. Reliable Controls is pleased to announce the official release of the MACH-ProPoint Output (MPP-O) expansion module, a flexible solution ideal for applications with large output requirements. Featuring 16 universal outputs, the MPP-O provides maximum output flexibility. Mix and match up to 8 MACH-ProPoint expansion modules (MPP-IO, MPP-O, and/or MPP-I) to achieve up to 128 inputs or 128 outputs. The maximum possible total I/O for any controller is 168 points. Expansion modules are daisy-chained to the I/O-Net port of a MACH-Pro or MACH-ProWeb controller in any combination while limiting the total inputs, outputs, and modules below the maximum. The MPP-O provides a sleek design with complete flexibility and optional HOA switches and 45 degree connectors. Models with the HOA switches have the switch position status displayed in the RC-Studio Advanced Workstation Software (AWS). RLE Develops SeaHawk product line. Our patented fluid sensing cable is designed to catch small leaks early (wherever they happen to be) and our monitoring units let you know there’s a problem immediately (wherever you happen to be). And when you know that you have a trickle right away and you can pinpoint pretty exactly where it is, you can pretty much handle the clean-up with a paper towel or two. The age of the mobile App is here. Connect securely to real-time and historical data for true role-based, man-to-machine mobile flexibility with MobileHMI™. Users will appreciate access to critical data from devices they own through their familiar application store. You will appreciate the speed and flexibility of the MobileHMI platform for creating personalized rich visualization, alarms and charts for any application. We will also discuss how you can create your own branded Apps, certified for popular Windows, Apple and Android devices. The ADAM-6200 are Ethernet modules with daisy chain networking, remote monitoring, and group configuration capabilities. These features enable the ADAM-6200 to connect to multiple devices and deliver information from a large number of sources. In the event of errors occurring on any of the ADAM-6200s, they can be remotely diagnosed and fixed. Ideal for small- to mid-sized applications, WAGO's 750-852 ECO ETHERNET Controller features a built-in two port Ethernet switch, simplifying network wiring in a line topology. Versatile and cost effective, the programmable controller enhances performance for high-speed applications. Fast configuration and diagnostics can be performed via web browser access to the integrated web-based management system. The 750-852 is easily programmable with the feature-rich CODESYS environment based on IEC 61131. The new CTRC AC Current Transformers from NK Technologies monitor circuits up to 2000 amps and produces a safe, low voltage output proportional to the RMS current value. This output is designed as an input to a power monitor or transducer, replicating the AC wave shape with phase angle resolution better than 2°. The flexible coil design allows the cable to surround multiple conductors or bus assemblies regardless of shape and eliminates the magnetically permeable core of standard current transformers while providing excellent isolation, sensing only the magnetic field of the phase inside the loop. The CTRC can be used in any power monitoring application. 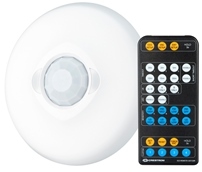 Crestron announced the release of its new GLS-OIR-C-CN occupancy sensors, ideal for conference rooms, hallways, and private offices. The GLS-OIR-C-CN is a highly accurate occupancy sensor designed to reduce energy costs and enhance the automation capabilities of Crestron lighting and environmental systems. Powered by Passive Infrared (PIR) technology, GLS-OIR-C-CN sensors are not susceptible to vibrations in the environment, reducing false occupancy activations due to nearby foot traffic, HVAC systems, or other local activity. These new sensors provide the most cost-effective solution for customers to realize the energy-saving benefits of lighting and environmental automation. Enable products to be wirelessly accessed and controlled over a network or the internet - The WiPort is a compact, integrated hardware and software module, enabling you to build wireless networking into virtually any electronic device with serial or Ethernet capability. The matchbook-sized WiPort takes the complexity out of RF design and embedded Ethernet networking and WiPort enables engineers to focus on their core competency of designing products. It minimizes engineering risk, reduces cost, and shortens development time. Just apply power and UART output, and the product is wireless and network-ready! Lantronix WiPort Key Benefits: 802.11 b/g wireless networking for virtually any electronic device; Wired Ethernet-to-wireless bridging; Bulletproof wireless security with IEEE 802.11i-PSK, WPA-PSK, TKIP; Secure end-to-end communication with Advanced Encryption Standards (AES); FCC Class B, UL and EN EMC and safety-compliant. For more information on the WiPort visit www.lantronix.com.